Synopsis: Dress your engine bay to impress! When I installed this Kingsborne Firebraid Ignition Wire Set on my Gen 1 MINI Cooper S, I was quite impressed by the refined throttle response and smoother acceleration. For such a minimal amount of money, the results were great. Custom cut to fit the MINI perfectly, this set is a compliment to the MINI engine bay. 8mm specially-wound core. Yellow, Red, Black or Blue Silicone with 1200 degree "Firebraid" shielding. 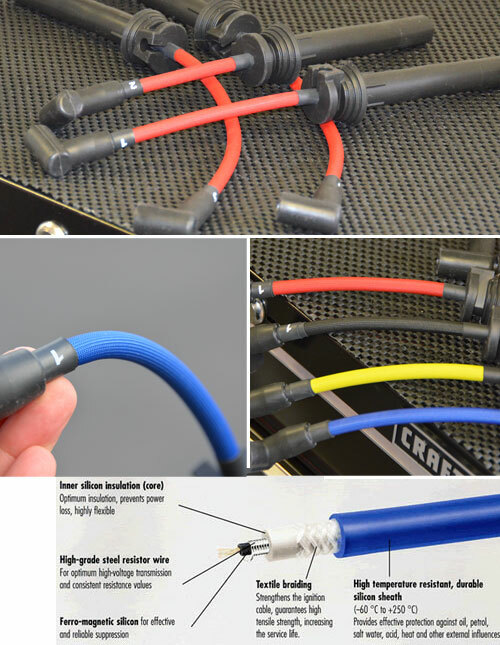 These are a great upgrade from worn or damaged stock plug wires and super easy to replace. It's also a good idea to replace the spark plugs at regular intervals. Check out our selection of plugs in the 'Ignition' section. All terminals/connectors are Beru which are designed to OEM specifications. BERU branded quality connectors are totally waterproof, resistant to corrosion and vibration, and very reliable. Overall this is a fantastic set of plug wires, installs in just minutes and carries a lifetime limited warranty.